Describe your journey, how did you find yourself starting Angel Face Botanicals? My educational background is in the fine arts. After school, I explored a few vastly different career directions. 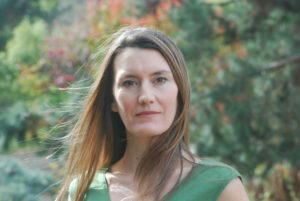 I worked as a digital retouch artist at a corporate photo studio, was Assistant Director of a prominent art gallery in San Francisco, and then moved into real estate. All the while I was using unscented products due to chemical sensitivities resulting in chronic headaches and other health problems. I needed a change and I was ready to make my life’s work into something really special, that inspired health and well-being, and made a significant positive impact on people and our environment. I had studied herbs in my 20’s and had dabbled in product making over the years. Some dear friends introduced me to the divine art of self-care, essential oils, and truly exquisite all-natural products. With thoughts of wellness and change in my head, I went out for a run. I came home and immediately brainstormed out a business plan that would become Angel Face Botanicals. 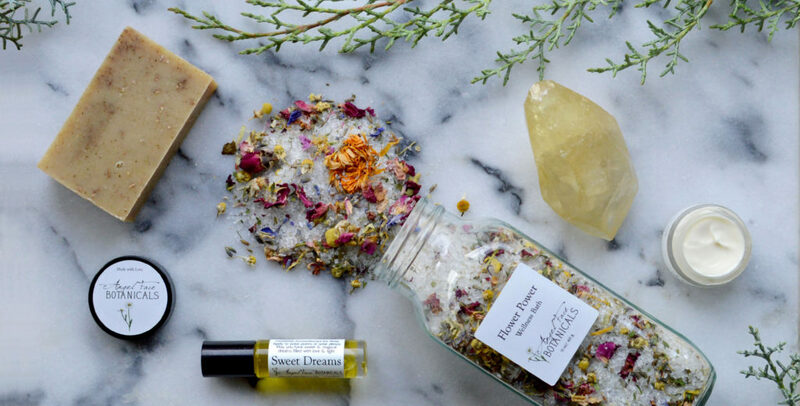 The concept of clean beauty is catching on in a big way. Consumers are much more aware and educated than ever before and this is very exciting. Every time someone chooses a clean beauty product over a conventional chemicalized product, the market for toxic chemicals decreases. The positive impact of this choice is exponential: the individual benefits, the organic farmers benefit, and the Earth benefits. 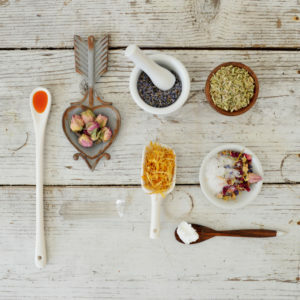 My most favorite ingredients are organic or wild–crafted botanicals. 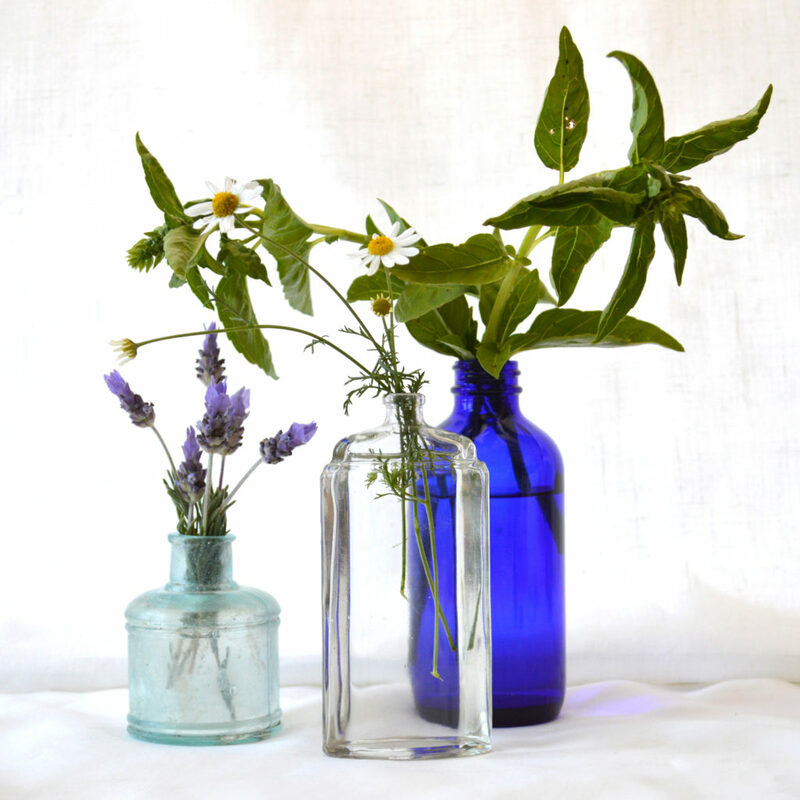 Organically grown botanicals are simply bursting with life. They are beautiful and have higher vitamin and nutrient profiles – a sort of cosmic purity. They smell extraordinarily good and produce exemplary results in our skincare products. My most beloved product is probably the Flower Power Wellness Bath, because it was my Grandmother’s favorite. It’s also my most favorite thing to make because it is so beautiful with all the flowers and sparkling salt crystals – like heavenly magical jewels spilling from my hands. I think the Super Detox Cleanser is the most beloved by my customers. It’s had a cult following since I first introduced it and it works so well for most skin types. As you can imagine, I am a total skincare junkie and I take a holistic approach to my beauty routine including lots of water, a healthy diet, yoga, and meditation. A typical day starts with tea and fresh juice with lots of tonic herbs. I dry brush before getting into the shower 2-3 times per week. I wash my face with Super Detox, sometimes with a konjac sponge but most of the time I just use my fingers. Then I tone with Grace on a cotton pad followed by Illuminesce and a spritz of Rose Crystal Toner. Strawberry Rose Vitamin C Serum comes next, followed by another spritz of Rose Crystal. If I’m going to be in the sun, I will add some Drops of Shade to the serums. I let the serums sink in for 5-10 minutes, spritz with Rose Crystal and then apply either the Chamomile Exquisite Cream or the Jasmine Cream if my skin needs more moisture. I repeat this at night, adding in the Everlasting Eye Serum and sometimes I will use a mask as well. As I get into bed, lately I’ve been testing some new lip balm formulas and I slather Lavender or Rose Garden Shea Butter Balm on my hands and sometimes feet. As my head hits the pillow, depending on my mood, I will spritz myself with Lavender & Aloe Toner and use the Sweet Dreams or Lavender Love on the inside of my wrists. Life is good. During the day I have Lavender & Aloe Toner sprays everywhere around work at the shipping table, on my desk, in the bathroom, etc so I spritz those a few times per day. I will use Illuminesce and possibly an oil or moisturizer in the late afternoon as a pick-me-up. Plumps the skin right up and gives me a mental and spiritual boost as well. At least once a week I give myself an extended facial starting with my Luscious Oil Cleanser followed by one or two facial masks usually the Super Detox Clarifying Mask and maybe I will try something from another clean beauty brand. I use the Honey Crystal 2-3 times per month and the Pineapple & Papaya Mask 4-5 times per month. I always put the mask on and then apply an indulgent amount of under-eye serum, usually the Everlasting and follow the masking with the toner, serum, moisturizer regimen described above. A couple times a month, the extended facial incorporates a luxurious bath and full body scrub down. In the bath I will use one of my bath salts depending on my mood, often an additional scoop of Himalayan salt or Dead Sea Salt, and some bath oil. After soaking for at least 30 minutes but probably more like an hour, I drain the tub and use an obscene amount of body scrub to slough the dead skin and deeply moisturize for baby soft skin. I feel beautiful after I meditate and do yoga. I feel beautiful when my hair is clean. I feel beautiful when I take good care of myself from the inside out. I feel beautiful when I am in my heart energy. I feel beautiful when my skin is glowing from being well-cared for. I feel beautiful when my customers share their happy skin stories because that brings me great joy. I feel beautiful when I am happy. Happiness radiates beauty. I don’t wear much makeup but I love Hemp Organics lip tint in Earth and wear that all the time. I live in a very casual hippie beach town and I work in a lab/warehouse where we start the day with yoga. I mostly wear (cute) yoga clothes to work because I get dirty and I need to be able to move freely. I don’t wear makeup to work. I used to feel like I needed makeup because my skin was so haywire with irritated red patches and blemishes. But since modifying my diet to exclude wheat and cow dairy, and using Angel Face Botanicals products, my skin is clear and not chronically irritated. I occasionally wear makeup if I’m going out. If I wear makeup, it’s natural vegan mineral makeup for sure. I have a Jane Iredale tinted sunscreen, W3ll People powder, and Mineral Fusion mascara. There are so many great natural make-up brands now I’m excited to try some new natural makeup soon. You go girl!! Let your creativity and ideas flourish. It is your unique perspective that will bring success. Success is relative. Decide what success means to you and do your best not to measure yourself against others. Celebrate your small triumphs and great milestones! Believe in yourself, know your strengths, and ask for help when you need it. We have a bunch of exciting new products in the works! Coming very soon is a reformulation of our beloved Pineapple & Papaya Mask which I am absolutely thrilled to share. The color is a vibrant rosy pink from the addition of hibiscus aka The Natural Botox — yes! I’ve added inflammatory passion fruit seed oil to boost cellular renewal and ylang ylang essential oil which balances both dry and oily skin types. The tropical fruity-floral scent really ups the sensory experience to another level of awesome. For release later this summer/fall, I’ve been playing with herbal infusions over the last year or so which have produced some amazing results. 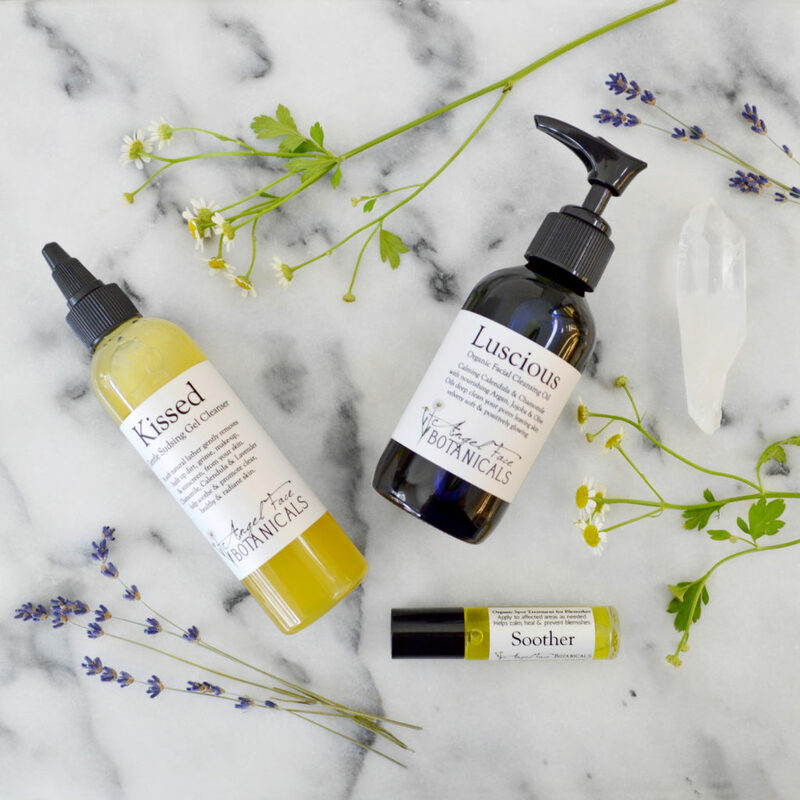 With these infusions I have four facial oils in the final phases of formulation and testing: a daily sun serum, a calming blend for sensitive and inflamed skin, an anti-aging concentrate for maturing skin, and a balancing blend for oily and acne prone skin. I’m very excited to share these new creations with you! 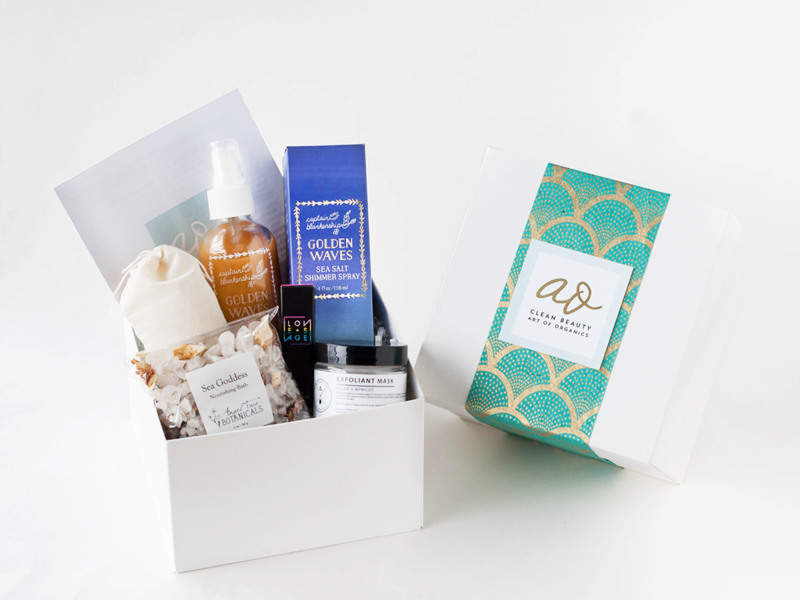 Angel Face Botanicals’ Sea Goddess Mineral Soak is featured in June’s Clean Beauty Box MERMAID. Check it out here.